This volume in matrix structural analysis is written for senior undergraduate students. 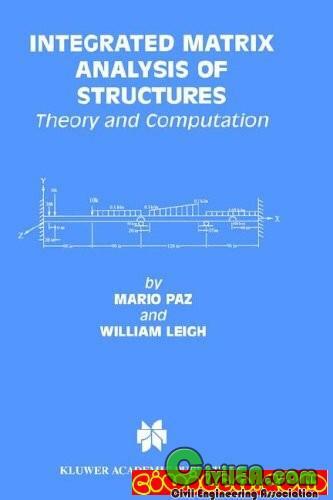 Matrix structural analysis is presented in the various chapters for structures modeled as beams, plane frames, grid frames, space frames, plane trusses, and space trusses. An introduction to the related topic of the finite element method is also given. A CD-ROM accompanying this book contains not only the student version of SAP 2000 but also user manuals and numerous sample problems and examples. Throughout the book, illustrative examples are given with detailed solutions derived from hand calculations and from using the computer program. Long mathematical proofs have been relegated to a section on analytical problems at the end of each chapter. Appendices give the equivalent end forces for typical loading needed in matrix structural analysis. An extensive glossary is also included; this serves as a convenient reference for the student to locate definitions, concepts, and formulae. This text is essential for undergraduate civil engineering students. Professional civil engineers interested in a simple presentation of matrix structural analysis will also find the book useful. If you like the book, we strongly suggest to buy it! Support the author(s)!